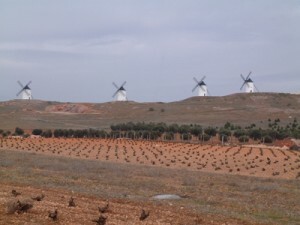 In a time when vineyards across the world are rushing to plant popular grapes, La Mancha winemakers are mostly sticking to the grapes from Don Quixote’s Days. Palacio de Galiana from the Navarro Lopez Family Group holds true to this time-honored style, producing D.O. La Mancha wines in the small village of Cinco Casas with its forward-fruit, well-structured wines. Palacio de Galiana’s 2010 Luna Negra Tempranillo is rich with black fruit flavors of cherry, blackberry and cola and savory tannins. Palacio de Galiana also produces whites Airén and Macabeo grapes that make deliciously fruity pale yellow white wines with hints of green and tropical aromas. At Vinicola de Tomelloso, 28 wine families banded together to create an elaborate winery that would grow Airén, Macabeo and Sauvignon Blanc, as well as Cencibel (Tempranillo), Cabernet Sauvignon and Merlot. The result has been a highly respected winery with bronze, silver and gold medals from various competitions. Vinicola de Tomelloso’s Finca Cerrada Crianza, made from Tempranillo, Cabernet Sauvignon and Syrah, is a beautiful cherry red wine with garnet hues and hits the nose with black fruits. Its expression of ripe Tempranillo is lovely and luscious. It is soft, velvety and just a wonderful wine to have around the house. Palacio de Galiana and Vincola de Tomelloso are just two of many D.O. La Mancha vineyards trying to have a stronger U.S. presence. They were among 11 vineyards on the 2011 USA Road Show, where they set up trade tastings with wine trade and media.